Over the past few years, it has become clear to me that there is almost no firm brush pen I won’t buy, even though the flexibility of a brush doesn’t really suit my ham-fisted hard-pressing writing style. When JetPens got the Pilot Fude-Makase Extra-Fine Brush Pen back in stock (as of this writing, they might be out again - they sell out fast!) I snapped up one in orange and one in pink to test them out. I’ve only picked up a few softer broader brushes in my day, as I know full well those won’t suit my style. If that’s what you’re after, this definitely isn’t your pen of choice. It is much thinner and firmer than, say, one of Pilot’s Pocket Brush pens. The size and flexibility are somewhat similar to the Kuratake CocoIro Super Fine refills, but I’ve had always had problems with those pens having only two settings: too firm or too mushy. So, I was hoping that the Pilot Extra Fine would make for a good every day writer. 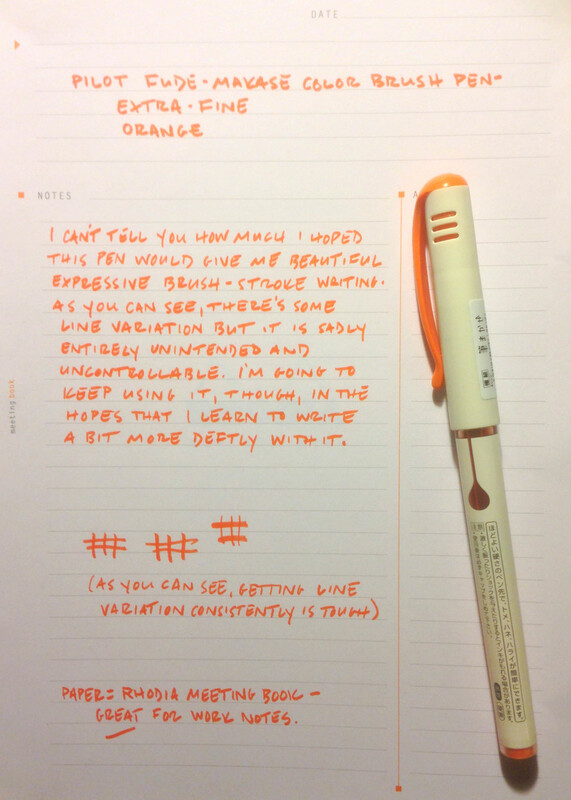 I suspect if you have a much lighter writing touch, you’ll love this pen. The brush doesn’t yield much, but you can definitely control line width easy while writing. I think I just write both too fast and too firm, so it ends up either just looking like boring old bullet-point marker strokes or I press too hard and end up mushing the brush rather than letting it glide across the paper. Honestly, at the price point (around $3 if you can find them in stock), it is a pen that is worth taking a chance on, even if your writing style isn’t really brush pen-friendly. It comes in a wide variety of colors and, even if it doesn’t make your handwriting look stellar, makes for a nice pop of brightness when writing. Posted on September 24, 2013 by Lisa Needham and filed under Brush Pen, Pilot, Pen Reviews.